Normal Human Lobar Bronchial Epithelial Cells provide an ideal model for the studies of toxicity, cystic fibrosis, asthma, pathogenesis, pharmacology or airway wound healing. 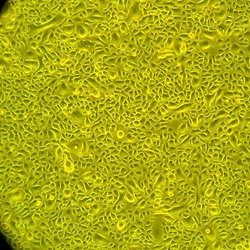 Lobar Bronchial Epithelial Cells have been isolated, plated and expanded in culture vessels twice before being harvested for cryopreservation to ensure the highest viability, purity, and plating efficiency. Lifeline® Lobar Bronchial Epithelial Cells are not exposed to retinoic acid during isolation or expansion. These cells are not exposed to antimicrobials or phenol red when cultured in Lifeline® BronchiaLife™ medium.